A 52-year-old female presented to the emergency department with left-sided chest pain. The patient was afebrile and had a normal white blood cell count. 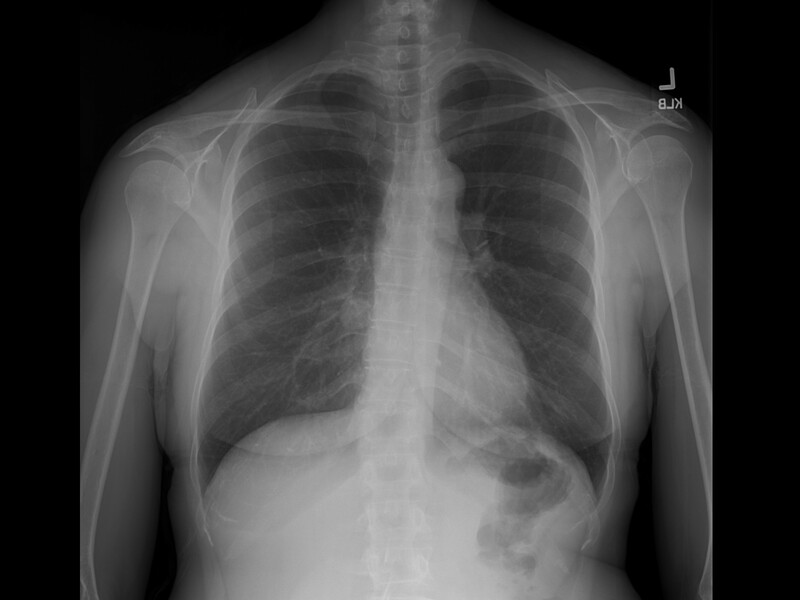 A chest radiograph was obtained for evaluation of the chest pain (Figure 1). 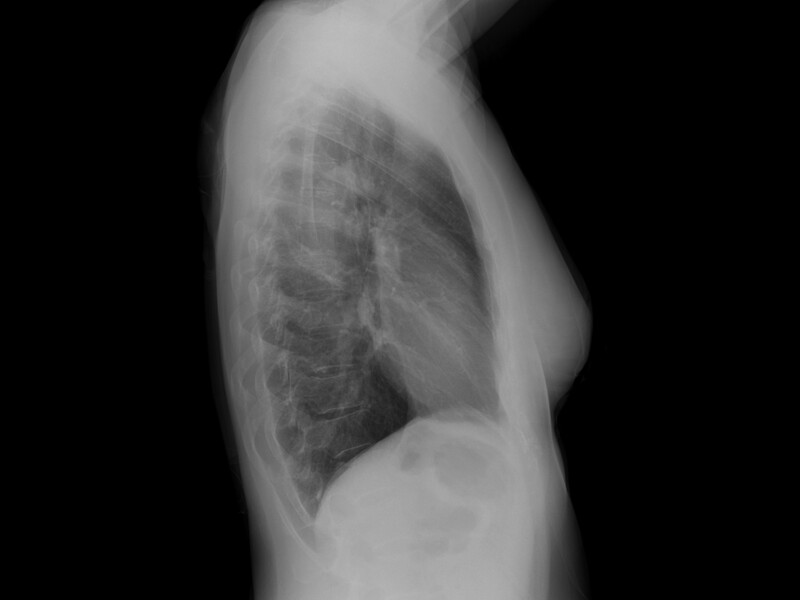 Based on the chest radiograph findings, a contrast-enhanced chest CT was also obtained (Figure 2). 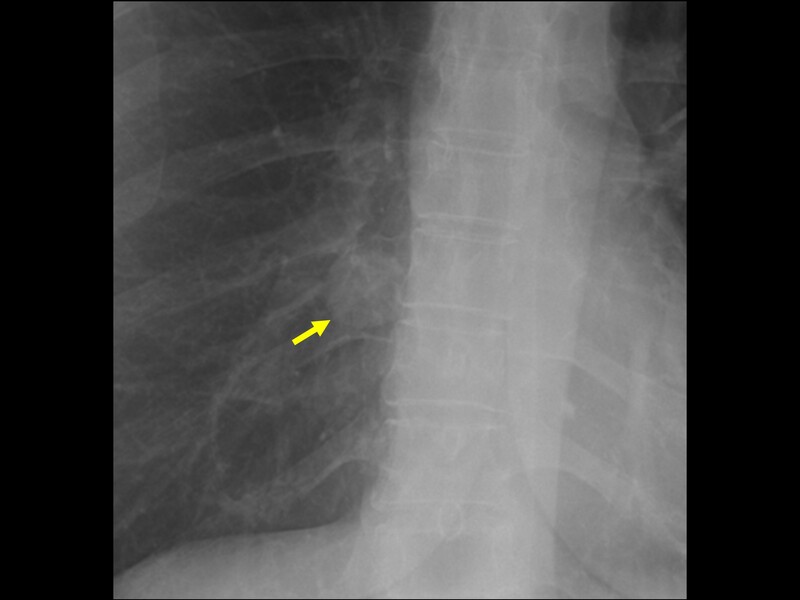 The chest radiograph demonstrated a well-circumscribed nodule in the medial right lower lobe (Figure 1). 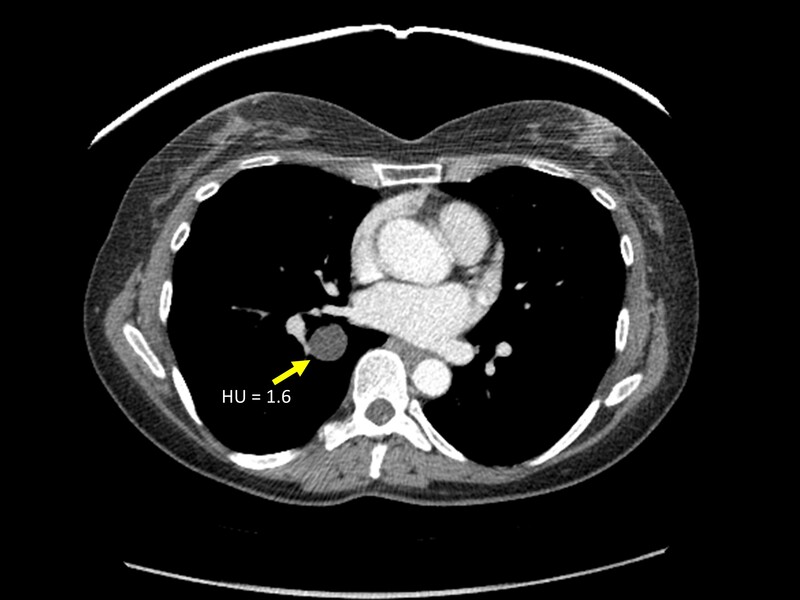 Subsequent contrastenhanced CT demonstrated a homogeneous, nonenhancing, thin-walled cyst in the right lower lobe (Figure 2). Hounsfield units measured 1.6. This cyst correlates with the nodule identified on radiography. Bronchogenic cysts may occasionally arise within the lung parenchyma rather than the more common mediastinal location. On imaging, these intraparenchymal bronchogenic cysts are typically well circumscribed oval or round masses. When the attenuation is clearly fluid, the diagnosis of a bronchogenic cyst is fairly straightforward. However, when the fluid is dense (hemorrhagic/proteinaceous), distinction of a cyst versus a solid lung nodule may prove challenging. Treatment is controversial and ranges from surgical excision to imaging surveillance. Shields TW, LoCicero J, Reed CE, Feins RH. General Thoracic Surgery. Lippincott Williams & Wilkins. 2011. Aktogu, S, Yuncu G, Halilcolar H, Ermete S, Buduneli T. Bronchogenic cysts: clinicopathologic presentation and treatment. Eur Respir J. 1996; 9: 2017-2021. McAdams HP, Kirejczyk WM, Rosado-de-Christenson ML, et al. Bronchogenic cyst: Imaging features with clinical and histopathologic correlation. Radiology. 2000;217:441-446. Yoon YC, Lee KS, Kim TS, et al. 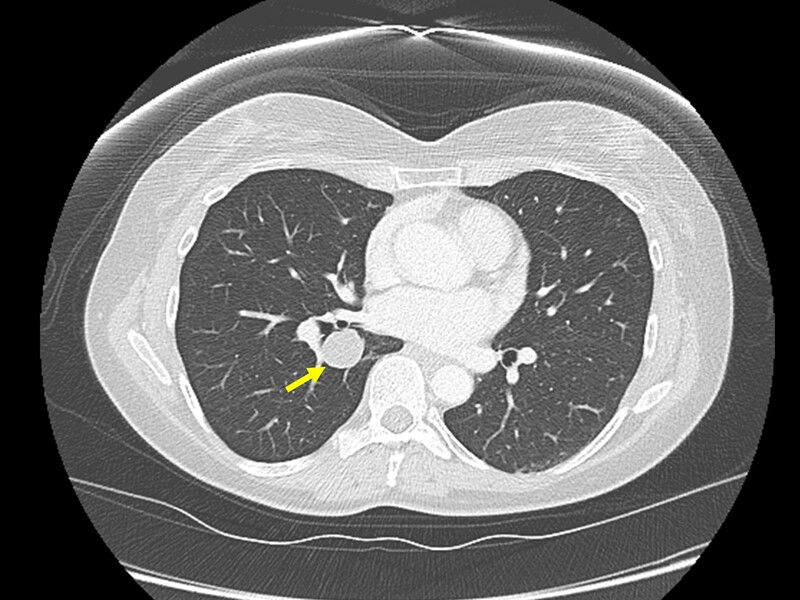 Intrapulmonary bronchogenic cyst: CT and pathologic findings in five adult patients. Am J Roentgenol. 2002;179:167-170. Kirmani B, Kirmani B, Sogliani F. Should asymptomatic bronchogenic cysts in adults be treated conservatively or with surgery? Interact Cardiovasc Thorac Surg. 2010;11:649-659. Loving VA. Intrapulmonary bronchogenic cyst. Appl Radiol. 2016;45(1):38-39. Prepared by Dr. Loving while a Radiologist in the Division of Diagnostic Imaging at Banner MD Anderson Cancer Center, Gilbert, AZ.